Home / pdf download / New Pattern: The Spectrum Tote is here! 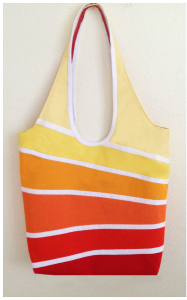 New Pattern: The Spectrum Tote is here! My idea was to use color gradients or one color evolving into another color and I loved it – and when my wonderful testers got ahold of it, I loved it even more. The test bags opened my eyes to the full “spectrum” of looks this one pattern can achieve. Go here to check out all their awesome bags! I love this tote because it can create so many different looks and has a ton of space. Inside, there is a zippered pocket and two little rounded slip pockets. The other great thing is that all the main exterior fabrics can be cut from 1/4 yard cuts or fat quarters so it’s relatively stash friendly. The tote can be sewn up fairly quickly and can be quilted. Instructions are included for adding different types of interfacings for changing the amount of structure the tote has. You will also find a number of online tutorials linked within the pattern and a bonus project. 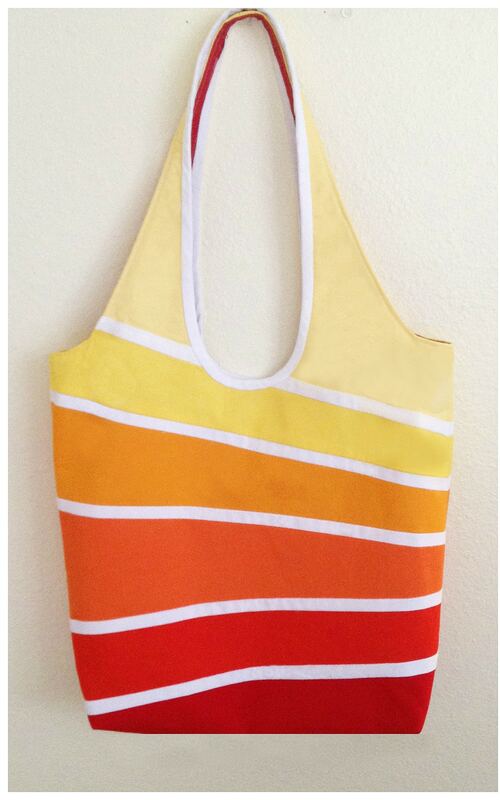 I hope you find the Spectrum Tote inspiring! I can’t wait to see what you stitch up! The good news: this pattern is done. The bad news: my kitchen still goes unpainted! I really like the look of this bag and want to see more. How do I see the full pictures? When I tap /click on them all I get is the pin icon and no option to enlarge the image. Updating my website seemed to work! Usually problems with this stuff aren’t so easily solved! I hope you enjoy looking at all the bags. Thanks again for taking the time to let me know! This is really a neat design–I’m intrigued by it! I love the inner bag features of pockets and key fob, and the exterior design is sooo cool. The testers’ bags are ALL inspiring! They are all beautiful interpretations. Thank you, Krista. I had designed it with just one color in different tones and then the testers came in and added all the prints.I was surprised at how totally different they could look but still be from one pattern! I’m glad you enjoyed seeing them!